Parents of a new baby spend the first year of their child's life getting to know her moods. 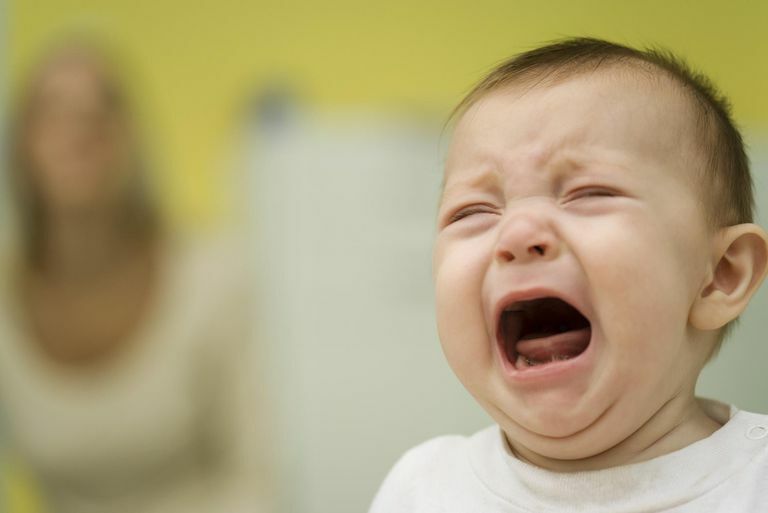 But right around their first birthday, babies start becoming more prone to tantrums, which can catch even the most attentive parent off guard. A content baby can suddenly be in a full-on meltdown like a switch has been flipped. Amid the screaming, it's important for a parent to stay calm, even though it can be difficult. The root of most tantrums is frustration. It can take time for a young child to learn how to express herself, and the disconnect between what they want and what they're trying to say is usually the point at which a tantrum begins. It is important for your baby to understand you care about her needs, so during these tantrums do your best to respond appropriately while maintaining healthy behavior boundaries for your baby. During a tantrum, parenting expert, Elizabeth Pantley recommends that parents first consider whether a tantrum is really a symptom of something else, like fatigue or hunger. Oftentimes babies who are overstimulated will act out since they feel overwhelmed. The key to preventing tantrums is being mindful of your baby's needs and anticipating them. Again, let's stress that this isn't easy, and if mom or dad is tired and frustrated as well, it's even harder. A tried and true way to prevent tantrums caused by frustration is to keep your baby on a predictable routine. Wake up time, breakfast time, nap time, bedtime, etc., should follow the same patterns as often as possible. This predictability gives small children a sense of security, which is extremely comforting. On days when you know the routine is going to deviate (grandma and grandpa are notorious disruptors, though their intentions are usually good), try to plan accordingly, whether that means an extra reward for good behavior, or an impromptu nap if a baby's looking fussy. Of course, there's no foolproof method to ensure perfect behavior at all times, and you'll likely deal with a tantrum at some point, regardless of how hard you work to avoid it. Kids have an uncanny knack for throwing their loudest tantrums in a grocery store or a nice restaurant. Just bear in mind that the more you react with anxiety, frustration, or anger, the more fuel you'll be heaping on the fire. Do your best to keep calm, speaking in a firm but soothing voice. Gentle touches can also help soothe her temper. Remember at this age, your baby will likely need help to calm down. It isn't a skill that she has on her own just yet. Another key thing to remember: Don't let an older baby or toddler use tantrums or unruly behavior to get what she wants. If you give in and buy that toy to stop a crying fit, you'll only reinforce this negative behavior. If you think your baby's tantrums are prolonged and bordering on out-of-control, or it takes a long time to calm her down, this might be something to discuss with your pediatrician, to ensure there isn't a larger health-related problem. Additionally, your mindset can help influence how you react. Have appropriate expectations for your baby's development. Be patient with your baby when she's in a new situation or with new people. Work with your baby as she is learning new skills and prone to frustration. Be sure to give yourself a break, too; many parents, especially first-time parents, blame themselves or think it's their fault when their baby throws a tantrum. It's a normal stage of every baby's development, and it doesn't last forever (although sometimes it does seem never-ending). By keeping a cool head and showing your baby you care about her needs, you'll weather the tantrum years just fine.